In the beginning there was a vision, a very big vision for Big Picture Framing: to create an excellent custom framing experience where customers enjoy beautiful framing, at a low everyday price, with fast quality service and without any worry at all. Our wonderful, talented and creative people make this happen each and every day! 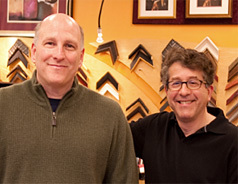 Started in 2000; Big Picture Framing was founded by Barry Stahl and Bob Clayton. Together they have over 30 years' experience in the framing industry. Almost a classic “garage” startup, they built the company around an old card table in their first store in Needham while construction spun on around them. When Barry and Bob met they found they shared many of the same values: an unwavering commitment to customer service, a need to create excellence and the desire to succeed by doing right. They found great synergy in their relationship and many laughs along the way. Big Picture Framing offers the total package in custom framing that every customer wants; superior design, fast service, an unparalleled unconditional guarantee and the best everyday prices in framing.